Since many of us are familiar with Christian traditions that have "exclusives" on knowledge and on hermeneutics - i.e. there are few acceptable ways (usually only one) interpret any given scriptural passage according to most churches today - it is sometimes difficult for us when we confront ancient materials to face the huge (and often contradictory) variety of explanations of given scriptures. This is even the case in the study of the gnostic literature, where I have seen us more than once want to talk about "the" Valentinian or "the" Sethian interpretation of a scripture. If a new text doesn't read that scripture in our pre-determined Valentinian or Sethian way, than it can't be Valentinian or it can't be Sethian. This is dangerous business indeed, because we are assuming that the ancient gnostic Christians had exclusive interpretations of passages. My reading of the gnostic literature reveals to me that this was not the case. That any given tradition - be it Valentinian or Sethian or whatever - had a wide range of acceptable hermeneutical possibilities for any given scripture. And that a particular community in fact may have held contradictory views comfortably. The gnostic literature isn't about exclusive views as many of us have been taught. 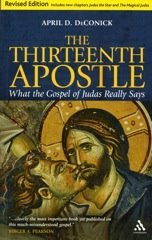 The gnostic literature is about uncovering a range of subversive interpretations of scriptures (that is, reading meanings out of the scripture that were not the traditional acceptable interpretations). Both the knowledge of the scripture and the manner of interpretation reminds me more of rabbis arguing and writing midrash, than it does Christian teachers trained in Hellenistic philosophy and apologetics trying to persuade a reader to "the" right view. I have been studying carefully the Sethian exegesis of the flood story and the Sodom story, and I am finding that their literature doesn't have a consensus view, other than an agreement that the flood story and the Sodom story was about the rescue of the children of Seth from the wrath of the biblical god. But what actually happened and who belonged to who and who tricked who, etc., are all up in the air as possible ways to read the story. Noah can be good in one text, and bad in another. Was he righteous, serving the supreme God, or the demiurge, the lower biblical god? Who was "hidden in the ark" (cf. 1 Enoch 10.2). In the Apocryphon of John, Noah is an enlightened gnostic (Epinoia comes to his rescue and gives him gnosis) and he and the children of Seth are hidden in a luminous cloud. So the children of Seth are directly his ancestors. But in the Hypostasis of the Archons, Noah is the father of non-Gnostic Jews and Christians, while the children of Seth are traced only through Norea the daughter of Eve. Noah serves Ialdabaoth. 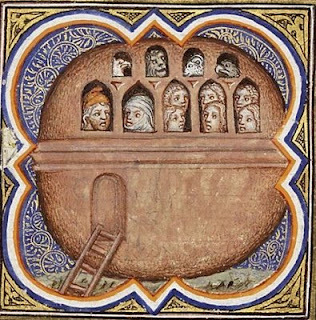 So when Norea wants to join Noah in the ark, he refuses her, so she sets it on fire and destroys it. Noah has to make it a second time. Norea is rescued by the angel Eleleth. In the Apocalypse of Adam, angels transport the children of Seth to the light realms where they live until they can be transported back after the flood and join Noah's descendants tricking the Demiurge. The gnostic writers were not forging an exclusive consensus view on scripture. What they were doing was acting like rabbis, exploring many possibilities, while trying to uncover the hidden meaning of the scripture. It appears that these communities thrived on hermeneutical problems and a wide range of solutions. Illustration from medieval illuminated bible: Jean Bondol, Bible historial. Paris, 1372. I have a question - Are there a range of views on the Giants in relation to the flood stories? Yes there are. They use the story to reflect several different parts of their mythology. It appears to have influenced their notions on Cain - that an archon(s) was his father. Also they use the story to explain the propagation of different "races" of humans. Sometimes they read it as an event that happened prior to the flood, sometimes after it. Etc. I'm a priest in a Gnostic church and since I started gathering a group for liturgy before I was ordained, I've always been uncomfortable with the notion of a homily. Instead I tend to ask the group to each talk about how they approach the core themes of the week and my job is to open up extra possible understandings.